I am really best at crochet, although I am learning to knit as well. I also enjoy felting. So, I've been working on a pattern for little crochet felted booties, and here it is! This pattern is for size 9-12 months (about 5" when finished) but you can easily adapt this pattern for smaller or larger feet simply by adding more rows where indicated, and making the foundation chain longer. 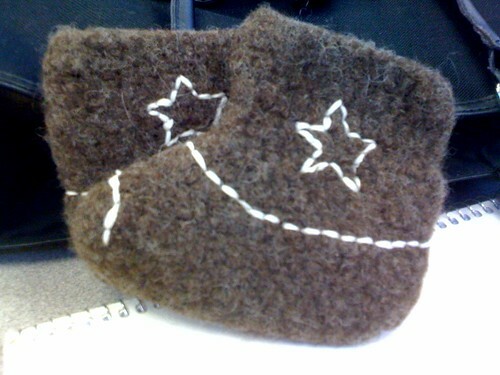 I made these precious booties for Emily's son, Colin. 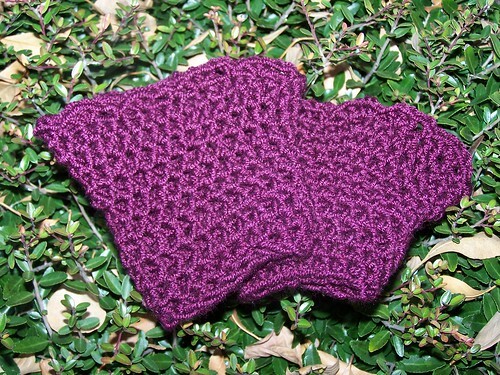 Then I made a second pair for Heather's daughter, Lily. 100% wool appropriate for felting (less than 1 skein). I used Lion Brand fisherman's wool for this project. Gauge: 4 dc sts = 1"
Round 2: Ch 2. DC in 1st 13 sts. DC 2 sts in each of the next 7 sts. DC in the next 14 sts. Join with sl st. Round 3: Ch 2. DC in each st around (42). Join with sl st. Round 4: Ch 2. DC in each of the next 16 sts. DC2tog 5 times. DC in each of the next 16 sts. Join with sl st. Round 5: Ch 2. DC in 11 sts. DC2tog 8 times. DC in 11 sts. Join with sl st. Round 6: Ch 2. DC in each of the first 10 sts. DC2tog 6 times. DC in last 11 sts. Join with sl st. Round 7 & 8: Ch 2. DC in each st around. Join with sl st. Round 9: Ch 2 CD in first 11 sts. 2 DC in each of the next 3 sts. DC in next 12 sts. Join with sl st. Round 10: Ch 2. DC in each st around. Join with sl st and fasten off. 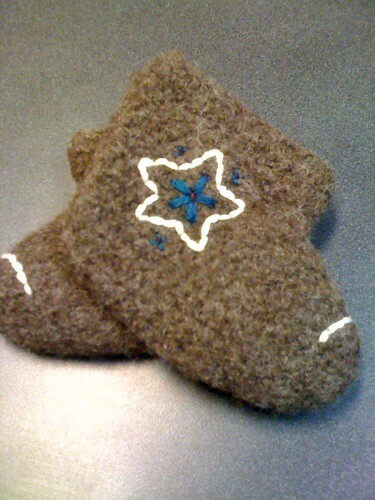 Length before felting = 6"
Notes about felting: I felted these in my washing machine, inside a pillowcase. It is a good idea to put these in a bag of some sort in order to keep the loose fibers from entering the washer and clogging it. Just wash on hot, use a tablespoon of laundry detergent, and lay flat to dry. I washed these twice. Need them a bit smaller? Just felt them again! I added the little star decorations afterwards with 50% rayon & 50% acrylic yarn, which I separated into strands of 2 ply each.